With the latest trend in the Ultra-wide displays in the market, there are more and more options for consumers every few months. 21:9 aspect ratio and overclocked IPS gaming displays (up to 100Hz) are becoming hugely popular and hence, they are becoming easier to afford. 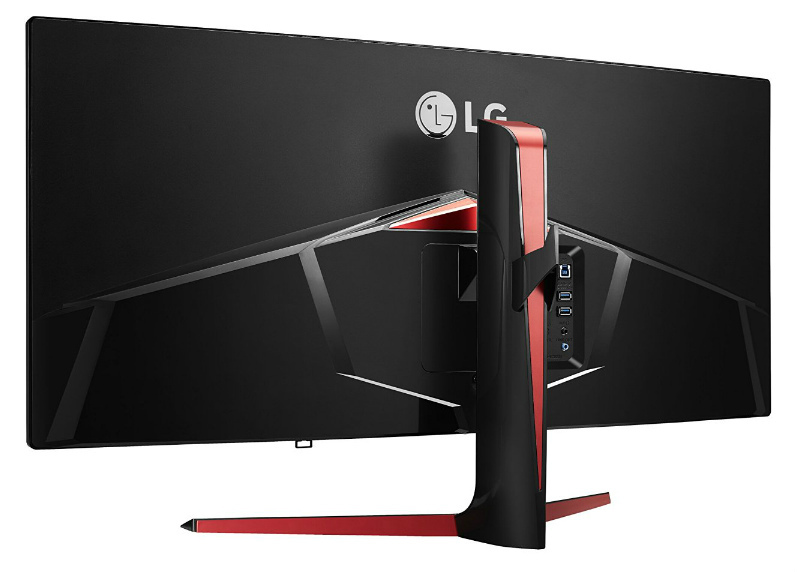 The LG 34UC79G happens to be one of the latest additions to this series of good Ultrawide displays and is getting the traction it needed because of its features. In this article, we will be covering the main features of LG’s first AH-IPS Ultrawide display that is capable of a 144Hz refresh rate and 2560 x 1080p resolution. The 34UC79G (or 34UC79G-B, which is a code name given to it because of its black matte finish) uses a top of the line AH-IPS panel that is 34-inches in size and has a gentle curve. The panel allows a resolution of 2560 x 1080p – something that is not the best in the market at the moment (considering you can get an Acer Curved 34-inch UltraWide 3440 x 1440p display for $90 more), but is still an intelligent choice considering that the response time of the display is 5ms. With pixels taking five milliseconds of time changing from one shade of gray to another, if there would have been a huge amount of pixels here (like in 4K displays), things wouldn’t have been so good, especially during gaming. Considering that this monitor is made for the multimedia lover as well as gamers, balancing the pixel count with an appropriate amount of response time and hiking up the frame speed with a 144Hz of refresh rate was a good idea. With a VRR (variable refresh rate) window of 50-144Hz, the 34UC79G also supports AMD’s Freesync. In addition to balancing the rate of frame transfer by synchronizing the number of frames the 34UC79G draws with the ones GPU gives out per second, the Freesync is also able to perform LFC (low framerate compensation). This is very useful whenever a game dips down below the lower limit of the VRR window, in this case, 50Hz. This reduces problems for the gamers and increases the overall high-speed motion viewing experience. No tearing, no stuttering or judder. The 34UC79G supports a 21:9 aspect ratio. The IPS panel allows 8-bit color reproduction, covering a wide spectrum of 16.7 million colors. The contrast ratio is at a standard 1000:1, however, the brightness stands lower than the usual 350cd/m2, at 300. The color gamut covered stands at an NTSC 72% here, with a pixel pitch of 0.312 mm x 0.312 mm. Now while these specifications are great for sharper images and very ‘true to the original’ colors, these aren’t ideal for editing work, or for tasks that require a coverage of over 99% sRGB gamut. The panel used is virtually ‘flicker-free,’ and WLED backlit. This supports sharper images and decreases the chances of flickering or stuttering when the monitor is operating at its maximum ability. The 34UC79G comes with a lot of in-built presets that allow it to go into different modes like a Game mode, FPS/RTS modes, cinema mode, reader mode (in this mode it dims down things to a reasonable point to avoid eye fatigue) and custom. And among these modes and other presets that are in them, the one that truly stands out is LG’s “1ms Motion Blur Reduction mode.” This mode works by reducing motion blur and operating at ‘virtually 1ms’, eliminating motion blur to help you out in games that demand a lot, like first person shooter games. Other great features include Dynamic Action Sync (that lowers the already low input lag), crosshair and the black stabilizer. So when it comes to firepower, the LG 34UC79G does not disappoint, unless what you are looking for is editing photos and videos or handling graphically intensive applications for work. The first thing to talk about here is the curvature of the 34UC79G – which considering the dimensions of the display (32.7 inches x 17.7 inches x 15.7 inches), could have been an issue if it was ‘too much’ or ‘too little.’ The curve has a gentle curvature of 3800R which is equally useful in creating a multi-monitor setup as it is in ‘virtual media immersion.’ Aesthetically speaking, the monitor looks like a premium choice. The ‘One Click-Stand Set-up’ allows you to set up the monitor with ease. The stand has a red and black color theme and is sturdy, having two legs on the bottom. It can be easily detached in case you want to use the VESA mounting capability and put the display up on a wall. The panel finish is matte which prevents reflecting your image back at you in bright environments. The panel offers a 178/178 degree viewing angle with no skewing or drops in color quality, and the build design offers some comfort too. 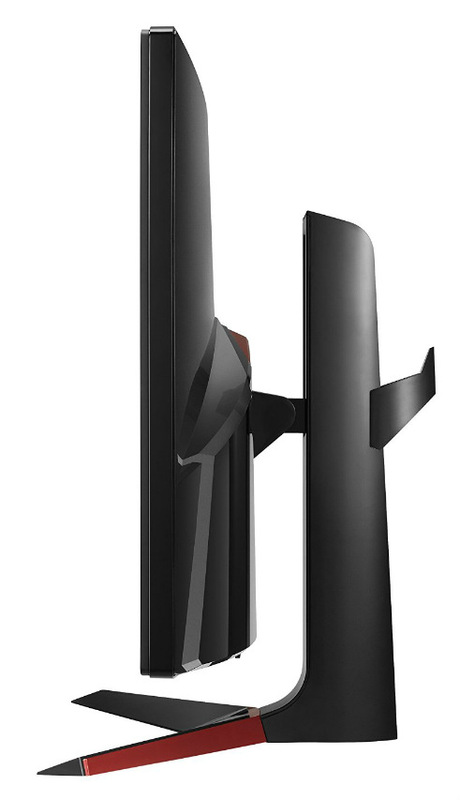 The design offers tilt (-5~20 Degrees) and height adjustment (120mm). However, pivot or swivel adjustment is not available with the 34UC79G. On the back, you have the connectivity ports lined up nicely on the right side in a no-frill fashion. These include one DisplayPort, two HDMI ports, and three USB 3.0 ports. One of these USB ports includes the Quick Charge technology that allows you to charge portable devices quickly while you are gaming on the side. The Displayport 1.2 has the capability of supporting a bandwidth of 17.28 Gbit/s in the HBR2 mode, and the HDMI 2.0 was developed keeping in mind the high gaming and graphics standards, supporting a maximum data transfer rate of 18 Gbit/s. So with these, there is not much you can’t get a hold of. 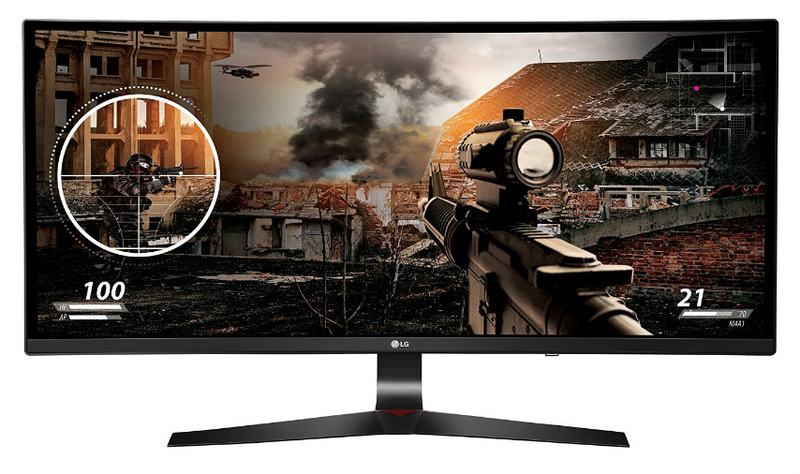 For $699, the LG 34UC79G (or LG 34UC79G-B) has a lot to offer for the multimedia enthusiast and the FPS gamer who wishes to immerse themselves in an unparalleled experience. 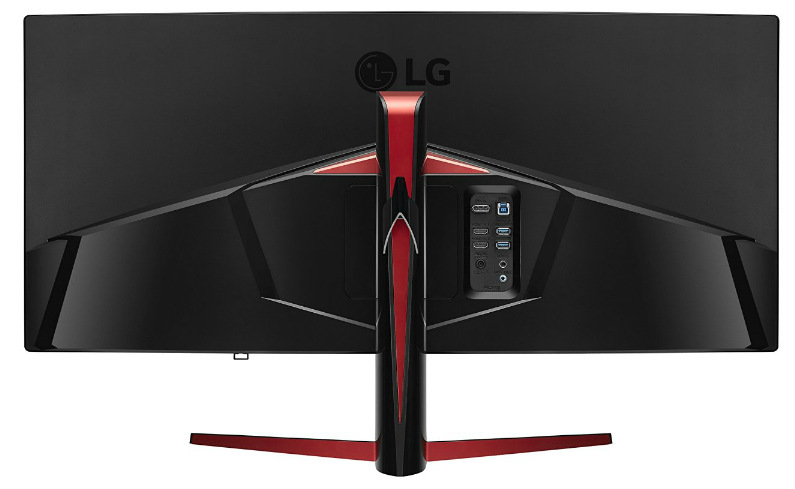 While the resolution can be seen as a con here, LG has converted a weakness into a strength here by sparing the expense on mounting more pixels on the panel and replacing it with adaptive sync, a higher frame rate and a lot of pre-calibrated options that make the gaming experience as lucid and hassle free as possible. This is compensated by what adjustment a 34-inch monitor can afford to give, and voila! We have ourselves an absolute treat. And as I already mentioned earlier in this article, if you are looking for a display that allows you to perform graphically intensive tasks, this is not it. This is also not for you if your primary goal is competitive gaming. You are going to need a display with a 1ms response time for that. But everything in between, the LG 34UC79G will do, and do it in a way that makes you love it. I did not buy the monitor for gaming, just for office applications. I would like to divide the monitor in different areas that should behave as different monitors. S if I choose for 3 areas, half screen and 2 small ones, I would like to see three monitors, a big one and two small ones, each in full screen. I have win7 and installed a app that give one the possibility to divide the screen in different areas, but every screen only shows a part of the window that is dragged in it. Hi, Rolandbr! The LG 34UC79G can only split the screen just the way you describe it, since it can’t do Picture by Picture which is a feature that allows different inputs from separate devices.